Tasting a beverage or food with awareness and analysing the sensory aspects and their qualities can be a difficult task for non-experts. All this requires a certain amount of attention and, above all, the ability to listen to one's senses, which are the wonderful receptors of everything occurring around us. In order to recognise a Grappa by its fragrance it is necessary to develop an olfactory memory and create in our mind an archive of fragrances to be used as a means of comparison in our tasting. But it is also indispensable to develop a gustatory memory. After establishing the fixed rules for the tasting procedure, an adequate terminology, and ensuring the correct course of everything, it is possible to express an opinion on what we are tasting. Every day we are bombarded with images that stimulate our eyesight, making this sense the main one, and forgetting that smell is the only sense that sends the information directly to the brain. Which is not the case with tact or hearing, or for our vision. We are conditioned through our sense of smell much more secretly than one may think. There is even olfactory marketing, which is concerned with enticing customers to purchase by means of olfactory stimulation. On entering a coffee shop in the morning, we are inebriated by the smell of coffee, but also in a cake-shop by the fragrance of vanilla, sometimes sprayed in the air to entice customers to purchase. Many more such examples can be mentioned, but the main thing is to be masters in reading our sensations. Very often, our eyesight is considered to be our guiding sense. But we have another four senses which are just as efficient, provided we learn to listen to them. In tasting, we make use of all our senses except, obviously, that of hearing. For distillates, it is advisable to analyse their transparency, clearness and colour. 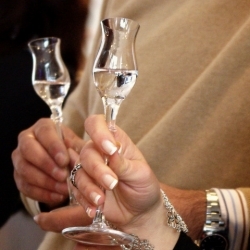 From an initial visual examination we can already know if the Grappa was correctly made, if there are any defects, and if the Grappa in question is new or aged. Our nose will reveal to us the intensity, elegance and complexity of the fragrances, and the breadth of the olfactory spectrum of a Grappa. Our senses of taste and touch will respond to the stimulation of the tongue and palate, crowning the sensations that previously anticipated the description of the distillate.